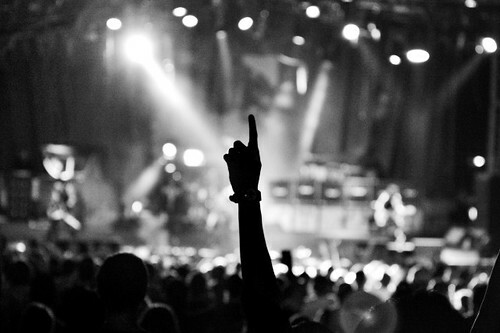 I’ve written many articles about rock stars and their concert performances. This article pays tribute to the unsung heroes that make the shows so brilliant and exciting. It’s about the wondrous scenes I got to witness Before (Load-In), Show-Time and After (Load-Out) the shows. This article is dedicated to the rock stars, their managers, the local rock promoters whenever they allow me to roam around the concert grounds, the roadies who set up the spectacular shows, and the sound & light teams who make the show sonically and visually explosive. Spoiler Alert: This article will not feature any images of rock stars in it. Only the Heavy Metal that provides the awesome hardware and structures that encase the show. 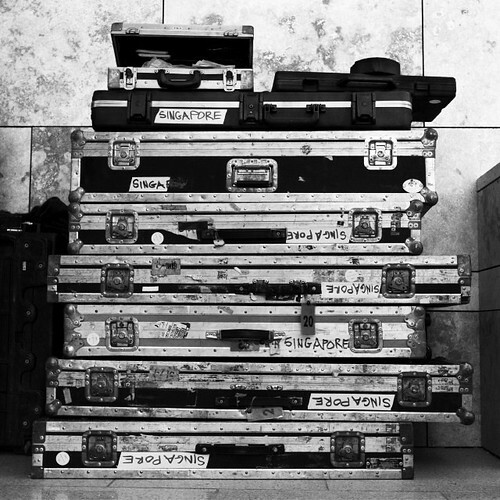 To me, the single visual that epitomizes the rock and roll life on the road, is the iconic flight case! The more battered, the better. 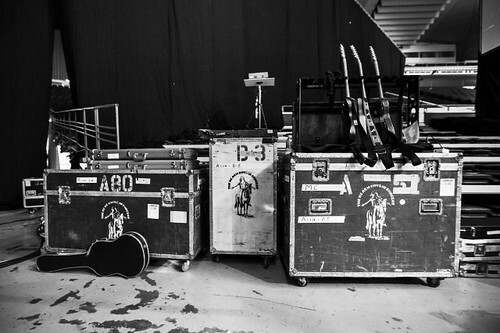 I liked the numerous ‘Singapore’ words marked on the flight cases. So randomly beautiful piled on top of each other. 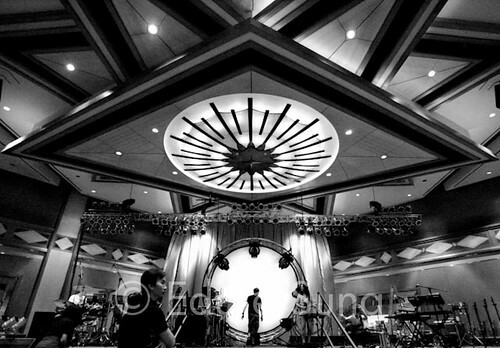 This b/w image is featured in the Beach Boys’ 50th Anniversary Live CD back cover. I was casually talking to their musical director when I noticed the flight cases next to where we were chatting. I took a quick snap and continued the conversation. 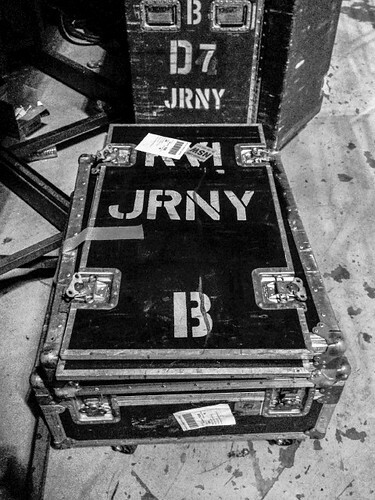 I love this shot because of the word ‘JRNY’ that not only signifies the legendary band Journey but also the rough journeys (cars, buses, trains, airplanes) that bands and their flight cases have to endure. 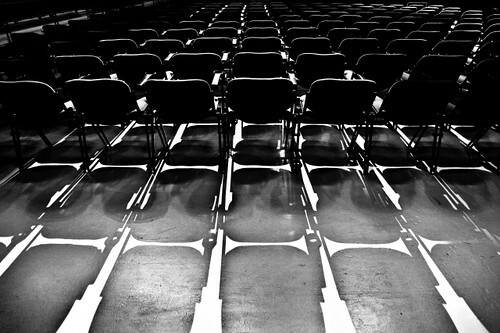 I like the shadows that lend artistry to the mundane-looking seats in the concert hall. This is where the light crew tests out the lights to complement the songs in the band’s playlist for the night. The view from where the stars see their audience. It’s quite a heart-stopping experience having shot countless occasions when the stars and their band members take their bow. This was taken during a dinner performance. The patterns from the roof and circular background formed a grand presence. 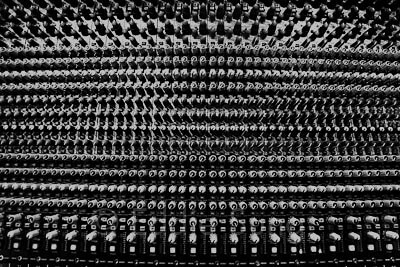 Interesting story here: when the Beach Boys sound engineer saw this image, he exclaimed “Hey, that’s my soundboard!” He was in Singapore previously with another legendary band. He went on to give me a history and technical evaluation of the awesomeness of this board. Thanks Mark! The five spotlights mark the spots where the five legendary Beach Boys stand and sing their harmony vocal parts. The spotlights were there for all of a whole second. After I took the decisive shot, it dispersed onto the roof. An integral part of a safe and sound concert. The ever-vigilant guards to ensure no audience is hurt, the sick are taken care of and any video filming prevented, and no professional cameras are used (unless with concert pass). 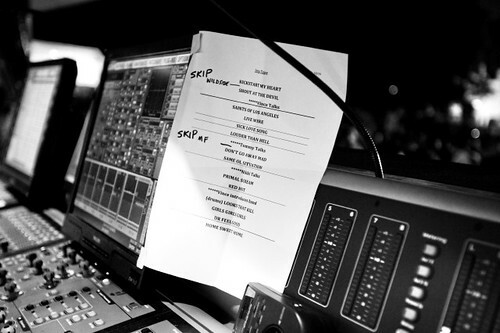 The playlist is the roadmap by which the sound and light technicians must traverse so the rock stars look great. Especially at certain parts of a certain song. Stay super-vigilant, they must. 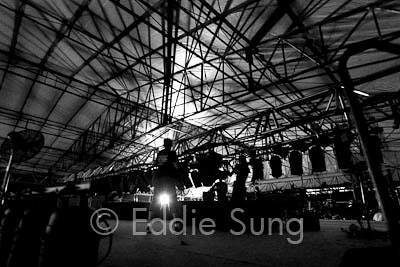 As you can see, this was shot at the awesome Motley Crue concert. Sometimes for major rock bands, the lights are impressive. This pattern was so magnificent; I knew had to capture it. 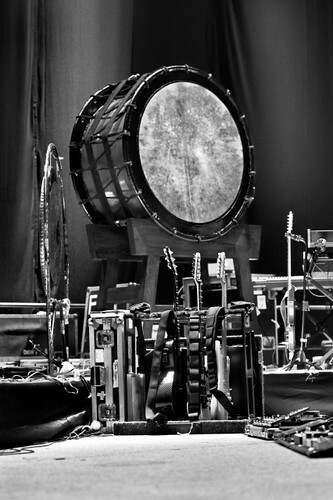 This is the maestro Kitaro’s musical arsenal. He kindly allowed me into his soundcheck. A multi-instrumentalist, he would end up playing all the instruments that you see. A true musical genius. I like the Fort Canning grounds for its greenery. Nature and Rock & Roll are always a winning combination. For a technically-challenged guy like me, I’m always amazed at the tons of wires that need to be connected. Which goes where indeed? 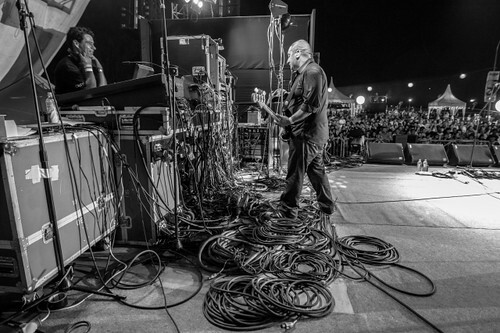 I’ve never seen such a great pile of wires at a concert before. The guitarist just plays his guitar riffs, totally ignoring the wires at his feet. Talk about dedication, this couple actually braved the heavy rain to watch their heroes perform. Tickets are usually on a rain-or-shine basis. 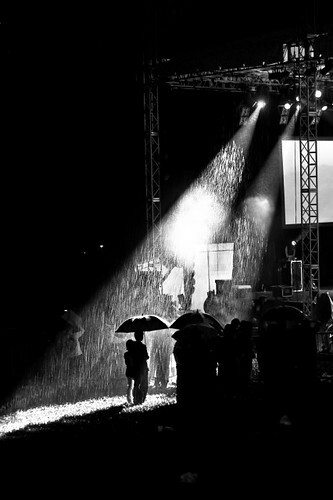 The shows carry on regardless of weather circumstances. This is what the show must be about, top-class performances where the sound and light show is flawless and the audiences are ecstatic. And shows its appreciation. In this case, by a singular approving Finger. The ultimate sign that a successful show is finally over. It kindly hints to the fans, time to go home, no point waiting for the star to sign his autograph, he’s left for his hotel. 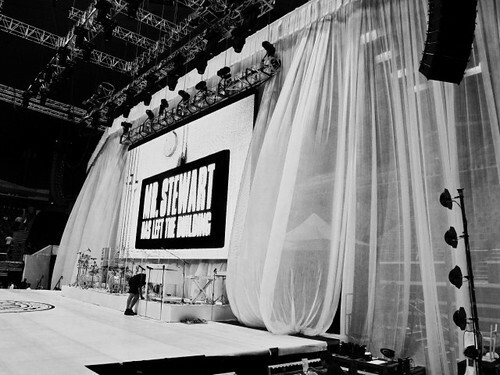 The artist has left the building, in this case, it’s Sir Rod Stewart! Thus begins the hectic Load-Out process. To be packed into the waiting plane or bus departing the following morning. Jackson Browne has actually wrote a song called The Load Out as a tribute to his roadies, fans and the rock & roll life on the road. Go listen to this masterpiece. 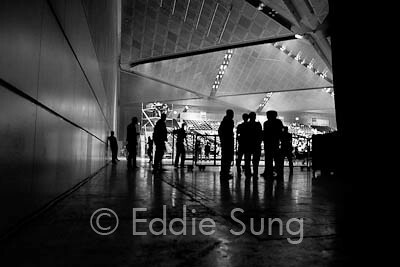 I like this image of the crowd slowly inching out of the concert hall, satisfied, and deaf after a loud and crazy concert. 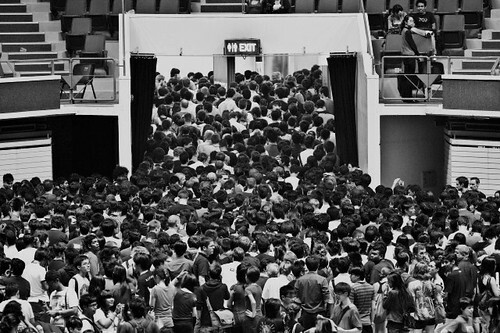 I like the toilet sign too – as if they were all rushing for the toilets. Usually I try to stay around to look at the roadies do their stuff. I patiently waited a while for this shot to happen where the sun meets the mountain top. 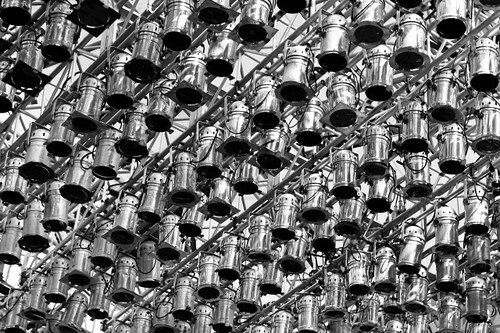 The load-out is a quick dismantling of all the structures, equipment and nitty-gritty nuts and bolts. 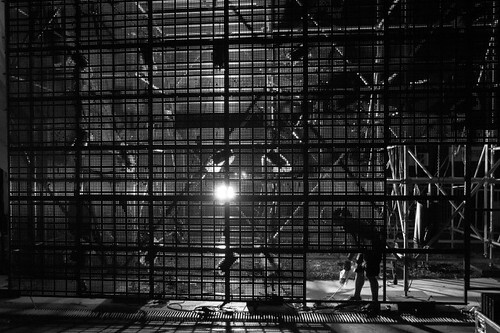 Every crew member knows his/her place in the jig-saw, sometimes in low-lit areas. 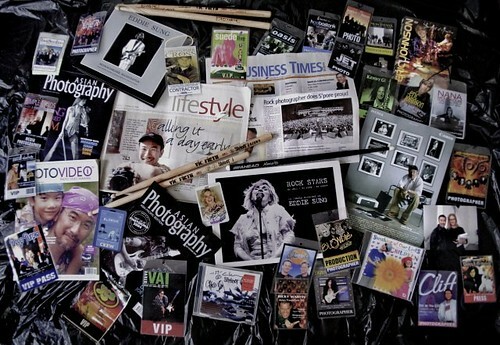 This shot was taken in 2007; these are my favourite mementos that marked my interesting rock photography journey – rock music photography books, CD/DVD cover & artworks, front page of newspapers, magazine covers and articles, concert passes, gifts from rock stars etc. 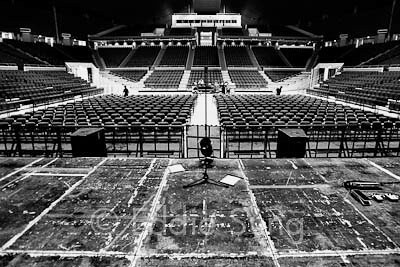 I’ve gone on to shoot many, many more concerts. 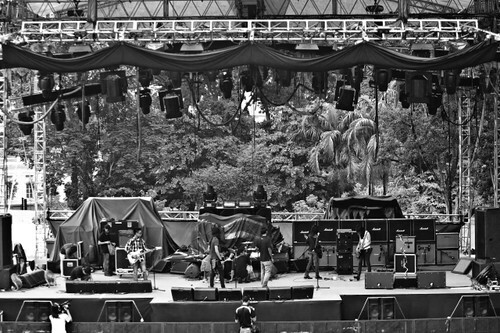 I thank the bands and promoters for letting me do what I was meant to do – take my rock and roll images. 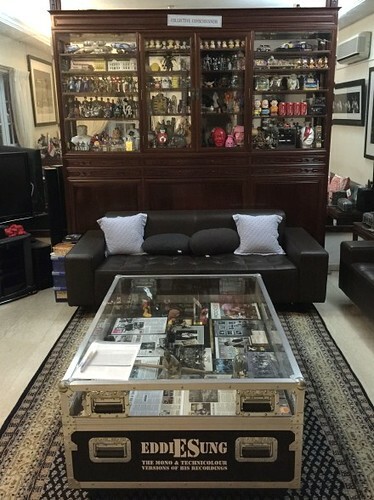 Yes sir, I love the iconic flight case so much, I even customised a flight case coffee-table in my living room. When visitors come to my home, they know they’re entering a rock and roll museum. Ha-ha.